I knew we were in trouble when I mentioned to Ben Meyer that we were planning to smoke a bone-in ham leg for Christmas dinner in a week's time. The owner of Old Salt Marketplace got a concerned look on his face and said, "So how long have you had it brining?" "Um…you mean I should have taken it out of the freezer already?" I responded. The meat injector. Scary, huh? A classic on all fronts. Fortunately he happened to have a spare injector that he could loan us, and brought out a tool that looked as if it was used in medieval dentistry or some other torture. 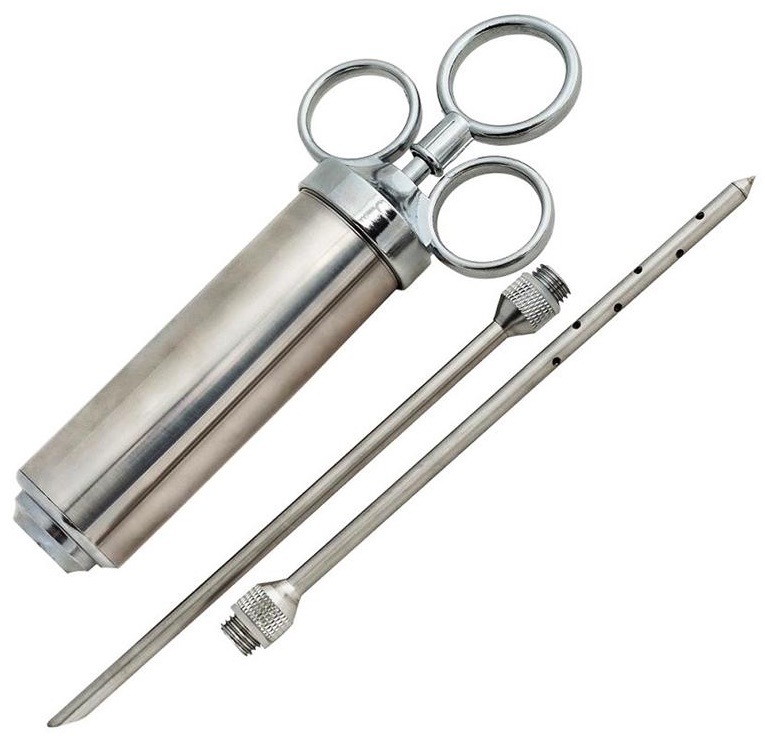 The main chamber is pumped full of brine, then the needle—in this case, one with holes on the sides instead of the end—is inserted perpendicular to the bone, spraying the brine into the meat. For the brine itself, he suggested using Paul Bertolli's recipe from Cooking By Hand, a groundbreaking collection of recipes for making everything from bread to charcuterie. I came home and ran to take the ham out of the freezer, leaving it on the counter to thaw. Two days later Dave made the brine, a beautiful and fragrant blend of vegetables, herbs, salts and water, and injected it every inch-and-a-half or so all the way around the leg. Then into the fridge it went, submerged in the brine to soak for six days. 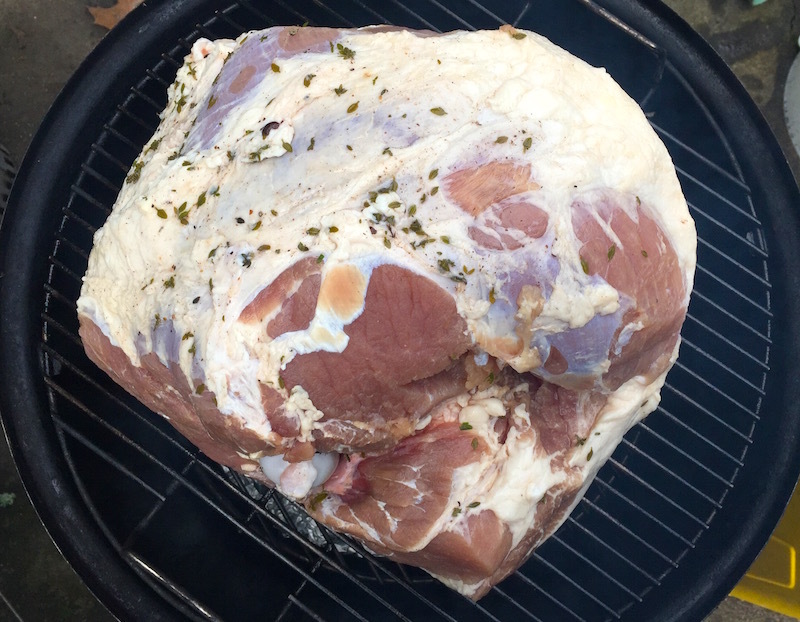 Dave pulled it out on Sunday morning, noting the hammy, dark pink tinge the meat had taken on from the curing process. He rinsed off the ham, then started the smoker with charcoal briquets, as well as soaking chunks of apple wood to add their unique notes to the smoked meat. He'd read various accounts of how long it might take to smoke a leg of pork that large, which ranged from six to 12 hours to reach his target of 140 degrees. He planned to keep his smoker in the 200 to 250-degree range, hoping for an overall time of eight hours. 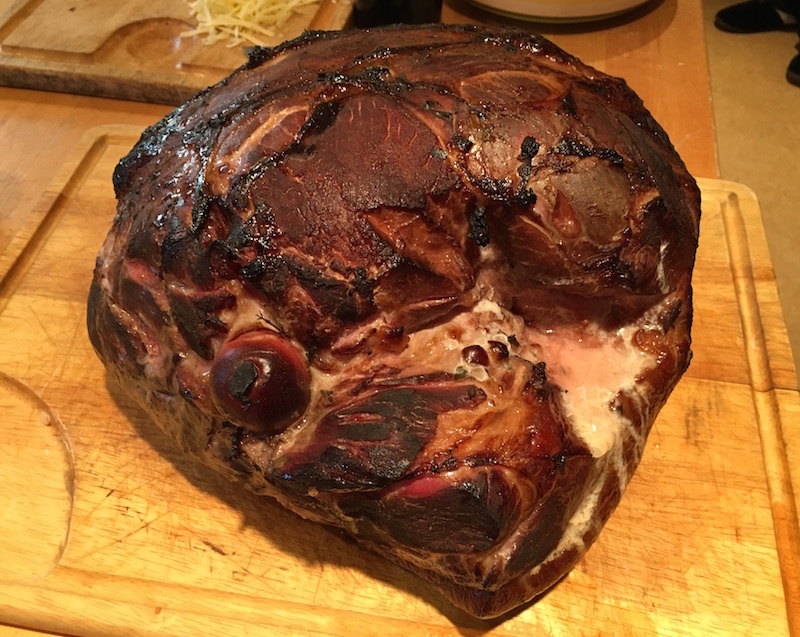 When the smoker was ready, he put on what we hoped was going to be a perfect ham. After diligently tending the fire, six hours and two or three beers later it reached the desired temperature. 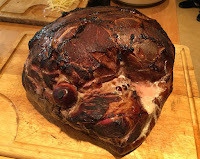 Since the ham needed to rest anyway, we just wrapped it in foil, planning to serving it at room temperature. But first, of course, a few samples were sliced off to make sure it was company-worthy. I have to mention here that, lest you think that this project was a no-muss, no-fuss affair that we just dashed off casually, the night before I'd laid awake worrying about how salty the ham might be, running through the coulda-woulda-shoulda factors of whether we should have soaked it in water the night before to desalinate the ham and what to do if we had 14 pounds of puckeringly salty meat to somehow find a use for. And what would we be having for Christmas dinner? The Chinese restaurant scene from the movie A Christmas Story briefly flashed through my mind. Fortunately I didn't turn over and shake Dave awake to relate my awful fears, I just turned over and forced myself to go back to sleep, probably one of the reasons we've managed to stay married for this long. Oh, and those first slices? Heavenly, probably some of the best ham I've had in my entire life. Which was confirmed by our happy guests, who demolished a good third of the monster along with the creamy scalloped potatoes infused with bacon, caramelized onions and mushrooms, as well as the roasted vegetables and the apple pie for dessert. A Christmas story with a happy ending? I'd say so. And the epilogue is that, after dinner, Dave was already saying he wanted to do it again. Soon. Brine and preparation of leg from Cooking By Hand by Paul Bertolli, republished with his permission. To prepare the brine solution, put the water in a large pot. Add the salt and sugar. Crack the whole spices coarsely in a mortar and add them to the brine along with the sliced vegetables and herbs. Warm the brine to 160° (F) to release the spice and vegetable aromas and to dissolve the salt and sugar. Chill the brine to 34°, stir in the curing salt, and dissolve it thoroughly. While the brine cooks, prepare the pork leg. Cut away the tailbone [if it hasn't been removed already] and trim away any skin, fat and glands that may remain on the flank side. Remove any excess fat around the skinless area of the aitch-bone. Place the ham inside a deep pan with the shank end facing you. First, inject brine directly through the base three or four times, adjusting the position of the needle so that the entire shank section receives the brine. Next, turn the leg aitch-bone up so that the shank end is facing away from you. Beginning at one edge, plunge the needle deep into the heavy muscle of the lower leg, directing the needle toward the bone. Continue injecting brine at 1 1/2-inch intervals across the leg. You will notice the various muscles of the leg swelling as you pump the brine [some will leak out, which is fine]. Once you have reached the edge of the leg, return to the starting point and make a second row of injections 1 1/2 inches behind the first. 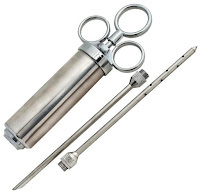 Continue altering the angle of the needle around the bone until you have injected the entire leg. In all it should take 15 to 16 injections. 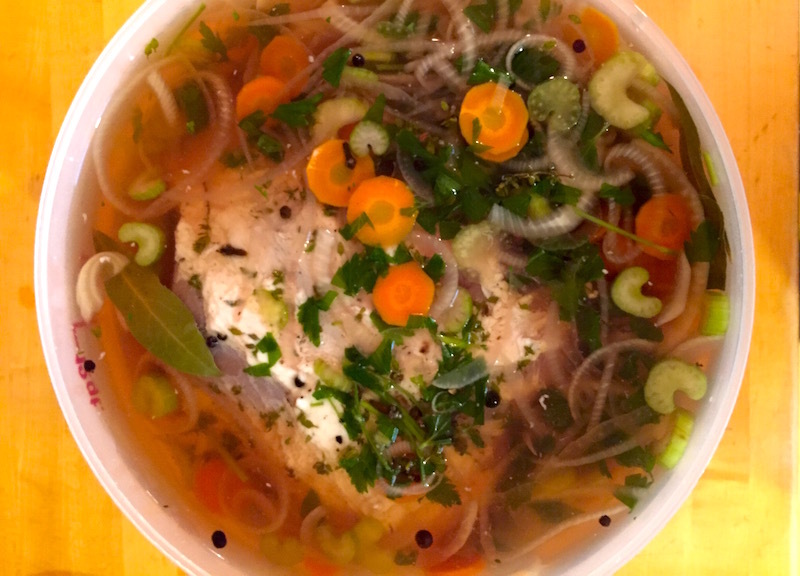 Place the leg into a bucket—we used a 12-quart Cambro container that fits in our fridge—and pour in the brine until the leg is submerged. Place the lid on the container and refrigerate for at least six days. After six days, remove the ham from the brine and rinse off. Discard the remaining brine. Prepare the fire in the smoker, adding whatever well-soaked wood chunks you prefer. Put the ham in the smoker and maintain the internal temperature of the smoker between 200 and 250 degrees, adding more briquets as needed. 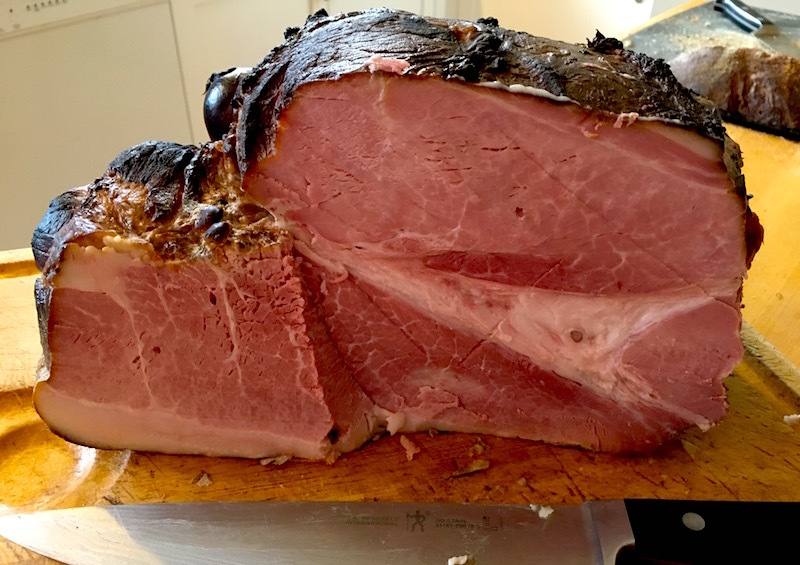 When the internal temperature of the ham reaches 140°, remove from the smoker and rest for at least 30 minutes before serving.